Age spots or liver spots are a common form of hyperpigmentation caused by sun damage, and are referred to by medical professionals as solar lentigines. They are usually found on the hands and face or other areas frequently exposed to the sun and will most likely increase with age. Age spots can vary in colour from brown to grey to black. They can also be very small or quite large and often appear in groups or clusters. They are common on people with fair skin who don't have as much natural protection from the sun. The reason they are known as age spots is due to the fact that the melanin accumulating in your skin over the years as you age can make you more susceptible to them but these pigmentation marks are not exclusively caused by ageing.Although they are also sometimes known as liver spots this has nothing to do with the liver or anything associated with the function of the liver. 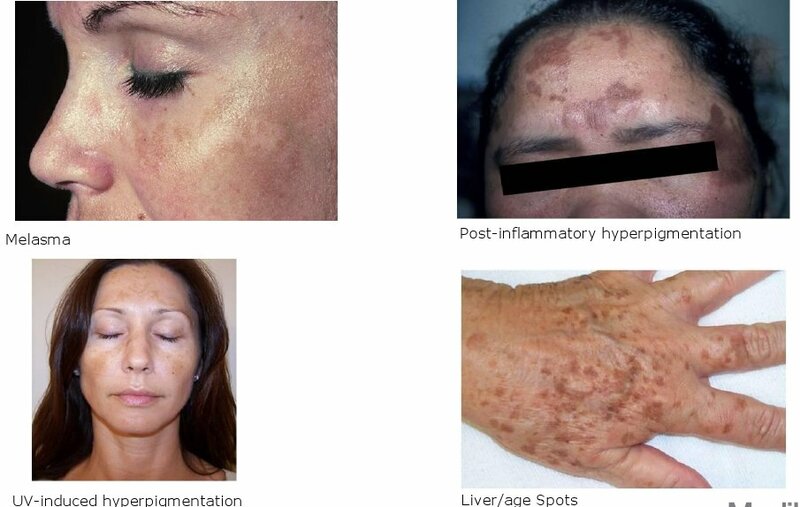 Melasma is the form of irregular pigmented patches and is commonly found on the sun-exposed face in the period during or after pregnancy or in women who are on the contraceptive pill.It is thought to be caused by increasing levels of both oestrogen and progesterone, which stimulate melanocytes resulting in increased production of the normal tanning protective chemical. Melasma or chloasma spots are similar in appaerance to age spots but are larger areas of darkened skin. The condition is also known as 'pregnancy mask' because of it's prominence in pregnant women and because of it's appearance as 'mask like' patches on the face. Melasma is usually found on the cheeks, temples and forehead but can also be found on the body. Melasma is aggravated by exposure to the sun. Freckles are small brown spots that can appear anywhere on the face and body. Freckles are an inherited characteristic and are most common on fair skinned people. Millions of people around the world have freckles and are less likely to seek cosmetic treatment for them than those who have other forms of pigmentation as they often regarded as 'a mark of beauty'. However people with freckles can be susceptible to other forms of skin pigmentation, such as spots, when exposed to the sun and the prevalence of freckles also increases with sun exposure. Post-Inflammatory pigmentation is caused when the skin has been damaged or undergone some form of trauma. It is commonly found in people have had acne but can also be caused by sunburn, surgery. Although skin pigmentation is in most cases harmless, many people seek treatment for cosmetic reasons. Wearing a broad spectrum sunscreen is the most important factor in preventing skin pigmentation.